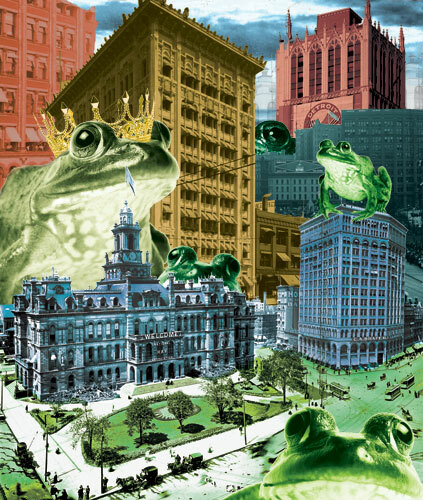 Before Detroit’s reputation was earned for cars, music, or even stoves, the city was legendary for one thing — frog legs. Lester Gruber, the founder and owner of the London Chop House and the Caucus Club, was interviewed by the New York Times in 1956 and said that even though Detroit was once French, the only vestige of French cuisine left in Detroit was our love for frog legs. That Detroit taste was found in roadhouses — frog legs rolled in cracker crumbs or flour and sauteÌed in butter. A dinner of frog legs was typically 20 cents 100 years ago. Many times it was “all-you-can-eat” — served alongside chicken and duck dinners and eaten at picnic tables outdoors along the river. But frog legs weren’t only served 100 years ago. They were on scores of menus a few decades ago, and seafood combos regularly included them among the shrimp, scallops, and perch. Frogs were hunted by many, but professionally by the region’s French Canadians — usually on the hottest days of summer — poling silently on little pontoons along the banks and reeds of the enormous St. Clair Flats or on the boundless marshes of Lake Erie at Monroe. They hunted them with tiny “cat and rat” shotguns filled with mustard seed. Many “fished” for them using a piece of red flannel as a lure; apparently, “bull” frogs couldn’t resist the dangling red cloth and got hooked and reeled in. Some hunters stayed prehistoric — preferring clubs, froggin’ forks, or spears to do the trick. said before a storm, during a dry spell, cool and cloudy day, or blazing hot July afternoon, the frogs would always seek out a corresponding hiding spot. During thunderstorms frogs were “on deck” and could be easily found. The party struggled with one man who chased a frog only to sink up to his waist in cold muck — it took the others 10 minutes to get him out. But they ended up with 100 frogs for the day. He was probably not married. In 1907 on a farm in Fenton, a man named Fred Butcher built a frog farm or “froggery” and raised nearly 40,000 dozen to sell across the country; on still nights the croaking could be heard for miles. He had eight to 10 men hired in the summer collecting frogs using wooden French frog rakes. Froggeries were a good business: In 1927 the U.S. Bureau of Fisheries estimated Americans consumed about 1 million pounds of frog legs. In southeast Michigan people caught and ate anything that leapt but commonly mentioned were bullfrogs and smaller frogs they called “russets.” Bulls were enormous — some up to 9 pounds with “legs as long as drumsticks.” When you consider the average-sized roasting chicken at the supermarket weighs about 5 pounds, these were monsters. But a frog that size was not good eating. It was said frogs tasted best from age 2 to 5 years; after that they were tough and too fishy. How hunters determined the age of a frog is never explained. Detroit restaurant menus offered every variation of frog legs conceivable. Examples from Michigan cook-books and menus included frog leg salad; frog ravioli; poached, pickled, fried in lard; or loaded into a frog leg pie, and always served with tartar sauce. In 1908 during summer months of summer the Garibaldi CafeÌ on Woodward Avenue would sell up to 1,000 dozen frog legs in a week. In 1905 J.F. Kohl, who ran the Detroit Opera House, was renowned for catching and eating frog legs. After a day of froggin’ with friends in the ponds of Northville the group was reported to have caught 40 dozen and Kohl alone ate 10 dozen in one sitting. Unfortunately, the Detroit and Ontario frogs were loved to death. As early as 1902 hunters were complaining about low numbers, and by 1908, demand exceeded supply; frog legs came from elsewhere. While the hotels and downtown restaurants obeyed, the roadhouses were too dependent on frog leg customers — so they sold them under the counter. On New Year’s 1915, Deputy Game Warden Charles Daniel placed phony orders for forbidden frog legs at roadhouses around Detroit and by the end of the day came home with about 1,000 dozen dinners. In addition, habitat and water quality was all but ruined in the 20th century. Today frog legs are seeing a small resurgence of sorts in Windsor, while many Michigan restaurants along the river from Port Huron to near Toledo still sell frog legs, no longer from the great marshes of Michigan but now from Vietnam, India, or Indonesia. Yes, there is still a frog season. They can be legally harvested from the Saturday before Memorial Day to Nov. 15. you cannot harvest endangered species such as the boreal chorus frog or Blanchard’s cricket frog. According to the state’s Michigan Fishing Guide 2014, there are no size restrictions, and the possession limit is 10 frogs. Oh, and to make it a “fair fight,” amphibians and reptiles may not be shot with firearms (including spring, air, or gas propelled), bow and arrow, or crossbow. Frogs may be speared but not with the aid of an artificial light. Hand, trap, nets, seines (up to 12 x 4 feet overall dimensions), and hook-and-line may be used. Dip them in milk, then in flour, and sauteÌ them slowly in butter in a frying pan over medium heat until golden brown all over — six to eight minutes. Remove to hot serving dish, salt and pepper lightly, and sprinkle with lemon juice and finely chopped parsley. Over all, pour what remains of the browned butter in the frying pan and garnish with a slice of lemon. Shake well and strain into a stem glass.